The Rapidprint ARC-E Time Stamp with analog clock face is for imprinting a variety of time, date and message combinations. Print automatically when paper is inserted. 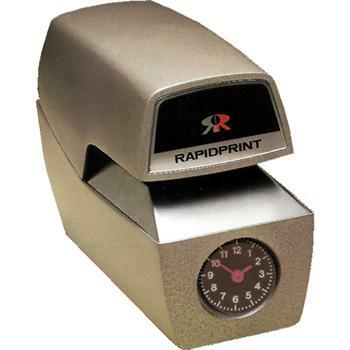 Rapidprint Time and Date Stamps is solid-state electronic circuitry assures consistent impressions. Rapidprint Time and Date Stamps are adjustable stamping force for multi-copy forms. Easy change ribbons advance and reverse automatically. Rugged die-cast case has a sturdy lock to prevent tampering. Solid brass type wheels provide superior imprint and durability.